Bowl Brush With Caddy Features An All-Plastic Construction To Clean Underneath The Rim And Down The Hole Of Bowls Without Scratching Like Conventional Wire Brushes. Chemical-Resistant Design Prevents Early Deterioration For Safe, Long-Lasting Use With A Wide Variety Of Cleaners. Lightweight Design Allows Easy Handling For Efficient Cleanings With Minimal Effort. 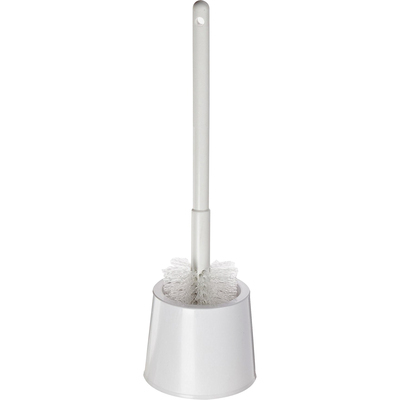 Included Caddy Allows Lingering Chemicals And Water To Properly Drain Into Its Built-In Reservoir..
Bowl Brush With Caddy Features An All-Plastic Construction To Clean Underneath The Rim And Down The Hole Of Bowls Without Scratching Like Conventional Wire Brushes. Chemical-Resistant Design Prevents Early Deterioration For Safe, Long-Lasting Use With A Wide Variety Of Cleaners. Lightweight Design Allows Easy Handling For Efficient Cleanings With Minimal Effort. Included Caddy Allows Lingering Chemicals And Water To Properly Drain Into Its Built-In Reservoir.